This tufa cast naja pendant has a free form turquoise stone at the top with a stamped, rough design. It measures approximately 2 3/8" long including bail (which is a shepards hook on the back) by 2 1/2" wide at its widest point. 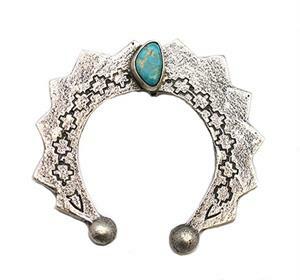 Crafted by Navajo artisan Cody Custer. Currently only this one available.